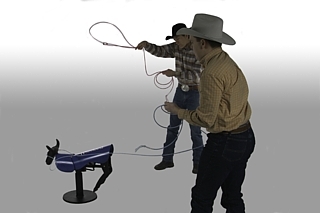 The machine features a realistic hopping motion so heelers can practice their timing. 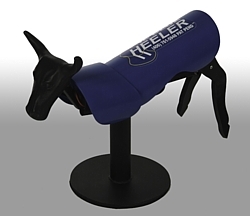 The LiL Blue Heeler is a very durable machine designed to be used indoors or out. It operates with electricity and also comes with a rechargable battery that provides hours of continuous roping per charge. The body swivels so headers can practice that perfect handle. 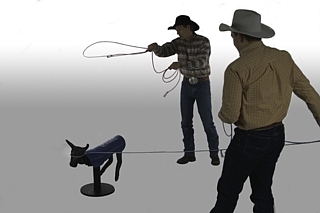 Because the LiL Blue Heeler has a 12" horn spread and is only 20" tall, it stores easily so you can practice at home all week and then take it with you on the weekend. 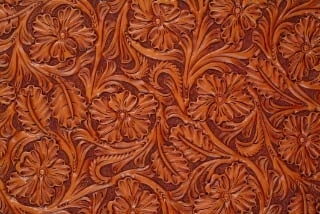 hours of fun and practice. A short video clip will begin playing in a moment.